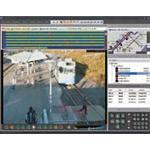 Aimetis Symphony is a surveillance solution providing a single platform for both video management and video analytics. The software is available in three editions and provides maximum flexibility to mix and match editions on a single server and upgrade from one edition to another, making it the ideal surveillance solution for users at any stage during the transition of analog surveillance to IP surveillance. The Standard edition offers a set of features for network video management and recording. The Professional edition offers advanced network video management and integration features for more complex installations, while the Enterprise edition combines all the functionality of the Professional edition with Aimetis' industry video analytic algorithms to provide full intelligent IP surveillance.